Parippu curry is one of the important ozhichu curry in the southern parts of Kerala. We serve it as the first ozhichu curry with pappadam and ghee followed by sambar, rasam and pullisery in my home town. But towards north of Kerala the ozhichu(poured over rice) curry is mainly concentrated on sambar and rasam. Pullisery is taken over as kalan in the northern side. H's place also follow the northern style curry pattern and so after marriage, I hardly make parippu curry for sadya. However, I prepare parippu curry as a regular everyday curry at home and serve with ghee and pappadam which kids do love. Split moong dal is used to make this parippu(dal) curry. Mom uses the whole moong dal to make parippu curry which does a lot better than the split moong kind. She roasts the whole moong well and then crushes on the arakkal (grinding stone) to split it in half and get the skin off(don't try crushing in blender as it gets fine powder in one or two crushes). Wash it nicely, most of the skin floats on water and can be discarded. 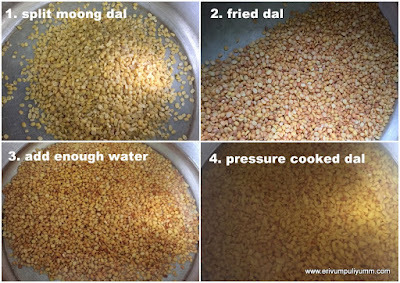 But I feel kinda lazy to do the tedious process and also don't have an arakkal(grinding stone) here too, I feel using split moong dal eases out the task. This is a midly spiced curry that is packed with protein and so small kids Onam starts with parippu curry and pappadam. Making parippu curry at home is quite simple keeping a few points to remember. The curry shouldn't turn very thick so add enough water to thin out and also remember that the curry thickens as it sits. This curry when served hot tastes best and so should be done accordingly. If you haven't tasted this yet,give it a try. Heat a thick bottomed pan and add the dal(I use my cooker itself). Stir fry the dal until lightly roasted or till its light brown in color. Switch off flame and leave to cool. 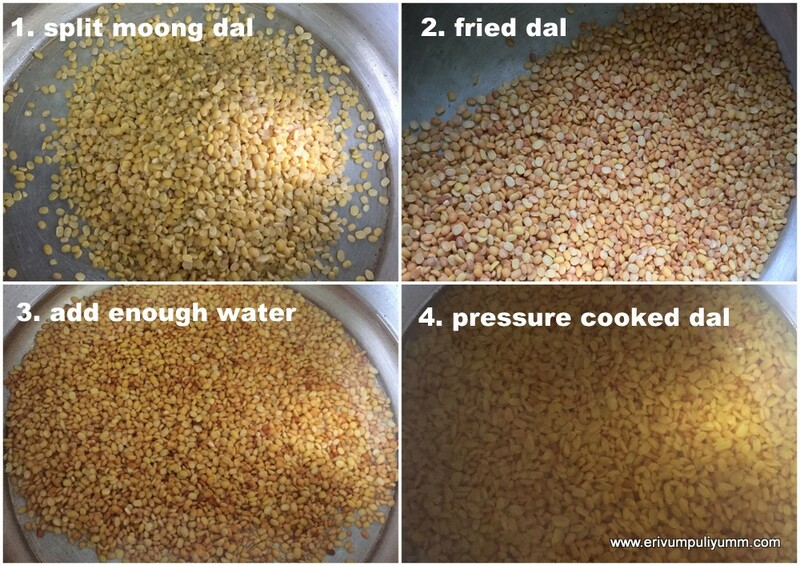 Wash the dal 2-3 times and add enough water(more than the dal). Add in turmeric powder and salt. Close in the pressure cooker with weights. Pressure cook for 4-5 whistles or till done(the dal shouldn't fully mash, there should be bits of cooked dal to chew). I love this way but you can fully mash too but I feel fully mashing thickens the dal and doesn't taste very good like the way I generally do. In the mean time,grind the coconut along with chilli powder,garlic cloves,and cumin seeds to a smooth paste adding little water. 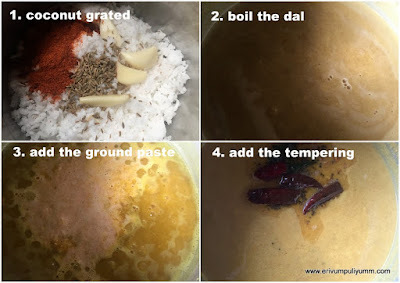 Add this paste to the cooked dal and simmer for 3-4 minutes or until the coconut mixture boils and the dal mashes slightly to thicken the curry. Add more water if its too thick and adjust salt. Switch off flame. Heat oil in another pan, add mustard seeds when hot. When it splutters add in the curry leaves and red dry chillies. Pour this over the curry, mix and serve hot with boiled rice,a tsp of ghee and pappadam. * The curry is mildly spiced curry, you can always increase the spices as per tolerance. * You can even add dry chillies to the grated coconut and grind. For more sadya recipes, click here. I have never had a pappadam...:-(( This is such a fantastic meal!